Notorious Ukrainian right-wing militant leader Aleksandr Muzychko, also known as Sashko Bilyi, has been shot dead during a police raid against his gang, confirmed Ukraine’s Ministry of Interior. 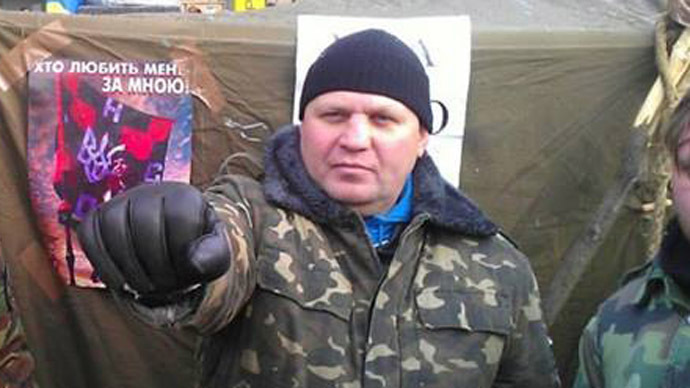 Muzychko was killed in Rovno, western Ukraine, where he coordinated actions of local groups belonging to the nationalist Right Sector movement. Police discovered a spare loaded magazine for a Makarov pistol and a total of $3,500 and 5,000 Ukrainian hryvnas in cash on Muzychko’s body, UNN agency reported to a Ukrainian Interior Ministry official as saying. Muzychko received three gunshot wounds to his chest and two to his right leg, the official said. 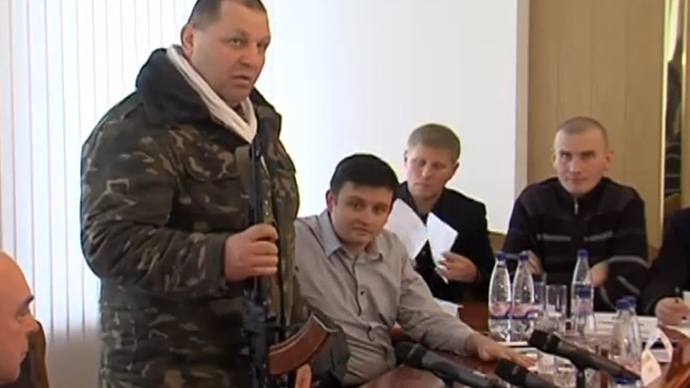 At a press conference dedicated to Muzychko‘s death, First Deputy Interior Minister Vladimir Yevdokimov announced that charges of hooliganism and obstructing law enforcement agencies had been filed against Muzychko March 8, and on March 12 Muzychko was put on the Ukrainian police’s wanted list. An assault group from the Sokol special police task force stormed the restaurant to detain Muzychko and his henchmen. The militant leader made an attempt to flee through a window. 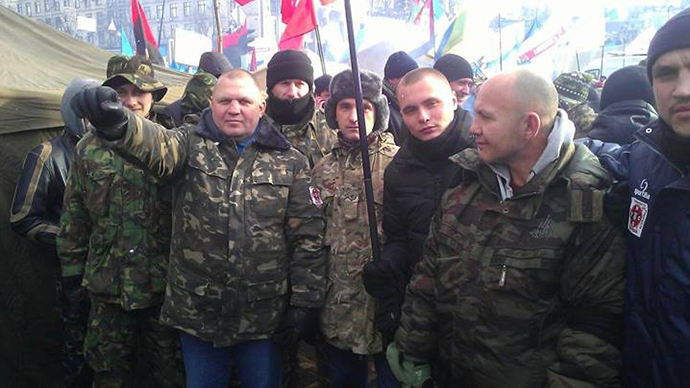 He opened fire, and two of his bullets wounded a police officer, who returned fire and shot Muzychko in the leg. Other police officers shot in the air, Yevdokimov said. Even after Muzychko fell to the ground, he continued shooting. “When [the police] attempted to detain him, they found out he was wounded. 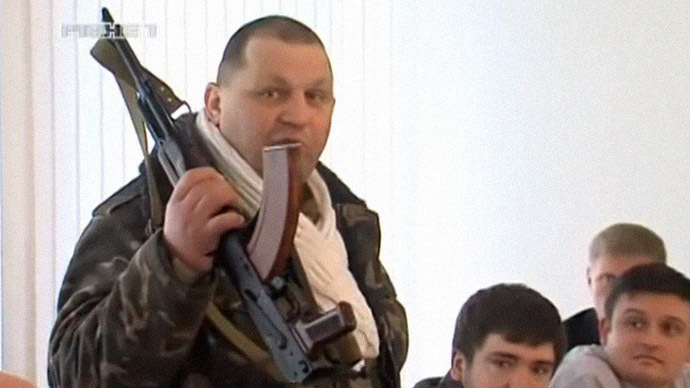 The medics who arrived at the scene proclaimed Muzychko dead,” Yevdokimov said. The three bodyguards, who were armed with Kalashnikov assault rifles and Makarov pistols, were detained by police. A former senior official at the Ukrainian Security Service (SBU) told RIA Novosti that the objective of the operation – carried out by SBU with the help of the Interior Ministry – was to kill Muzychko, rather than to detain him. 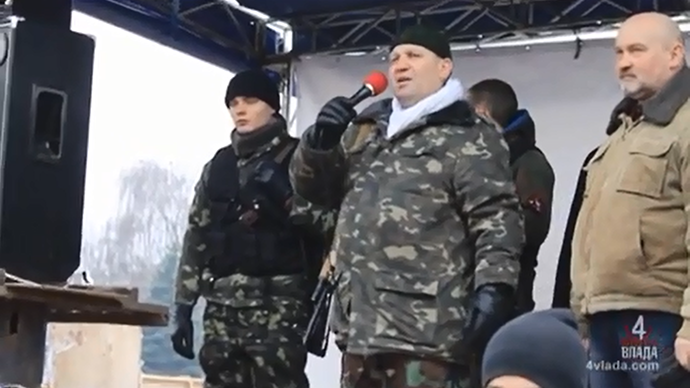 “The goal of the operation was not to detain, but to neutralize Muzychko, to remove him from the stage,” the source said, adding that the militant leader was undermining the new Ukrainian authorities and pursuing his own interests through his leadership of the Right Sector movement. The man was known for his radicalism, attacks on local officials during the coup in Kiev, and refusing to give up arms after the new authorities were imposed. Under the name Sashko Bilyi, he took an active part in the First Chechen War in 1994-1995, when he headed a group of Ukrainian nationalists fighting against Russian troops. Russia’s Investigative Committee initiated a criminal case against Aleksandr Muzychko in early March. The Ukrainian was accused of torturing and murdering at least 20 captured Russian soldiers as he fought alongside Chechen militants. Aleksandr Muzychko came under the spotlight of the Russian authorities after a series of scandals in Ukraine, when the radical nationalist leader went on with the rampage against regional authorities, lashing out at a local prosecutor, threatening local authorities with an AK-47 and making openly anti-Semitic statements.